A Contract on bronze sponsorship was signed today by the Chairman of the Executive board of DDOR osiguranje Mr Giorgio Marchegiani, and President of the Olympic Committee of Serbia Božidar Maljković. The event was attended by members of the current Olympic team: Andrea Lekić, Milica Starović, Jovana Preković, Jovana Rogić and Marko Dragosavljević, as well as sport legends and Olympic winners: Zoran Pančić, Milorad Stanulov, Aranka Binder, Slavko Obadov, Tadija and Slobodan Kačar, Andrija Gerić, Slobodan Boškan, Vasa Mijić and Vladimir Batez. 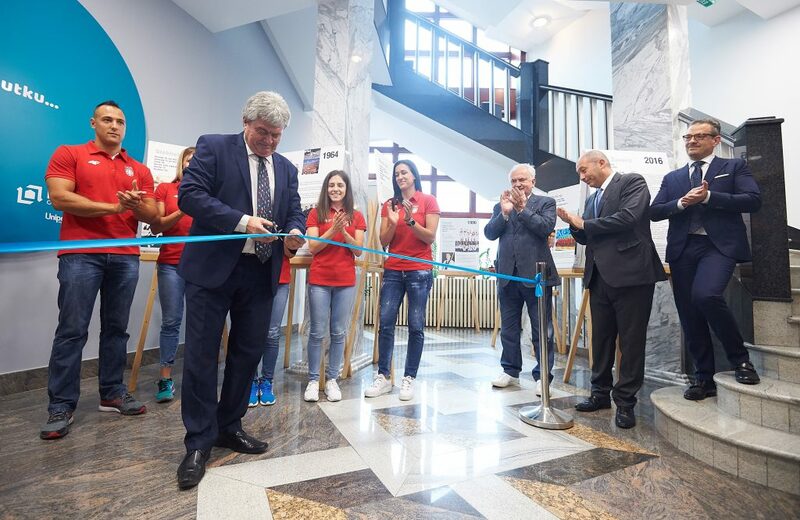 After the signing ceremony, the exhibition “Summer Olympic games through history” was opened in the lobby of the head office of DDOR osiguranje, in the presence of Olympians. The exhibition is located at 8 Mihajla Pupina Blvd. in Novi Sad and will be open for the public from June 13 to 21, 2018, from 16 to 20h on workdays and from 10 to 16h on weekends. We would like to invite all citizens to visit this interesting and educational exhibition. The entrance is free! DDOR osiguranje and the Olympic Team of Serbia – together to Tokyo!